With Gringotts Bank and the Weasley’s Ford Anglia, this week’s “Where in the Wizarding World of Harry Potter” becomes a bit more difficult than last week’s. Still not overly hard, but each week, the locations will become a little more challenging. 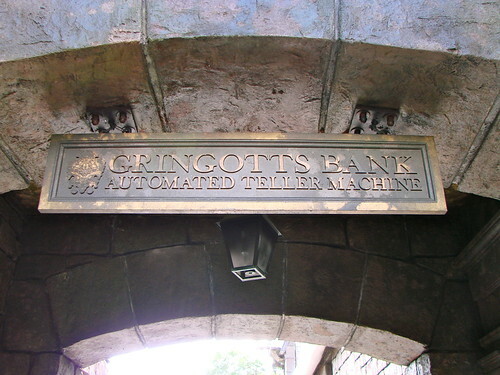 Gringotts Wizarding Bank, owned and operated by goblins, is the only known bank of the wizarding world. It was created by a goblin called Gringott (hence the name). Mr. Weasley’s Ford Anglia is a light blue Ford Anglia 105e deluxe that was heavily modified by Arthur Weasley. He enchanted it so it was able to fly, as well as become invisible. It was also modified so that it can fit ten people, six trunks, two owls, and a rat comfortably. It also apparently doesn’t run on petrol, or at least, it can never run out of petrol, as it was still running after being in the Forbidden Forest on its own for months. 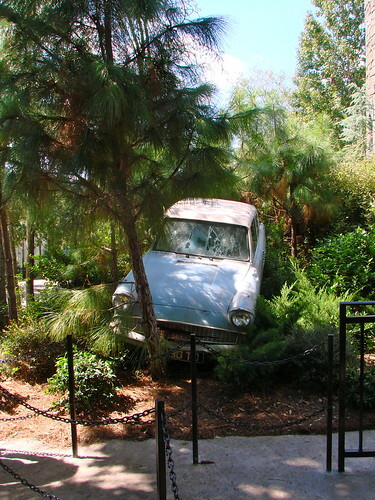 The current location for Mr. Weasley’s Ford Anglia looks a bit like the Forbidden Forest, but that’s not really the location at the Wizarding World of Harry Potter theme park. Can you help us determine it’s final resting place? Remember, we’ll update the post later today with the correct locations for each picture! Until then, comment away!